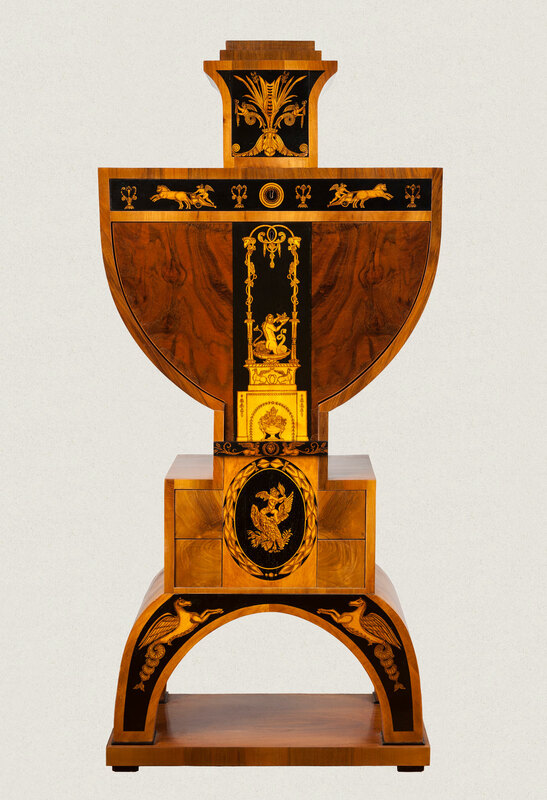 Pieces such as these took pride of place in the salons of the French imperial palaces. Known as a secrétaire – after the French word for secretary – they were veritable works of art. They drew the eye irresistibly, wherever they were placed in the room, commanding the attention of all who entered, with their regal appearance. The shape of this furniture is somehow reminiscent of a womanly figure. In fact, its audacious design verges on the sculptural – from the dainty legs to its slender middle and on up to the crowning touch of the very top drawer. 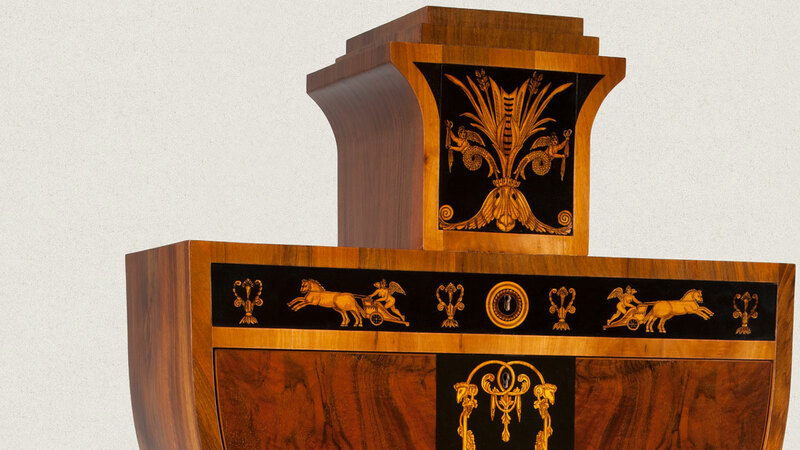 Our Jewellery secretaire’s shape is based on that of an empire-style secretaire made by Budapest master cabinet maker, Sebestyén Vogel, in 1810. It consists of pine panel and a fine veneer. For the most part, this piece is finished with a fine-grained walnut veneer, but the writing desk owes its exquisite beauty to a maple veneer. That said, what makes this piece particularly captivating is not the wood selected, but minutely detailed ink painting, buffed to perfection with a fine polish. The beautiful exterior, however, is only half the story. Yet more treasures are only revealed to the curious eye as the writing desk itself is opened. There are eight little drawers with poplar veneer for keeping jewellery or watches in and drawers above the mirror for letters or documents, while secret compartments can give refuge to your most treasured belongings. 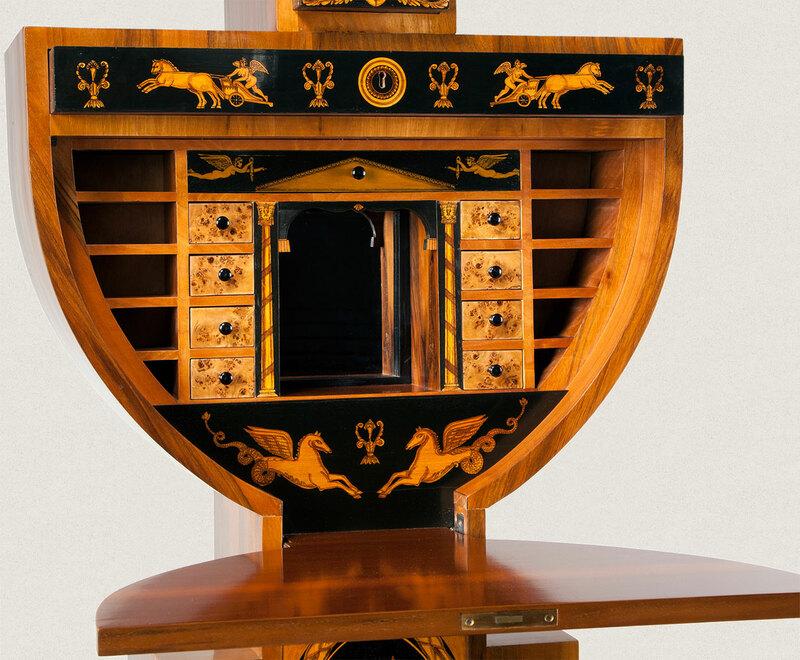 Despite its beauty, perhaps the most fascinating aspect of this secretaire is the cunning design of the secret compartments. The Jewellery secretaire is being produced in limited edition series of 33 only. The dimensions are 161 x 74.5 x 30.5 cm. For price information, please contact us.